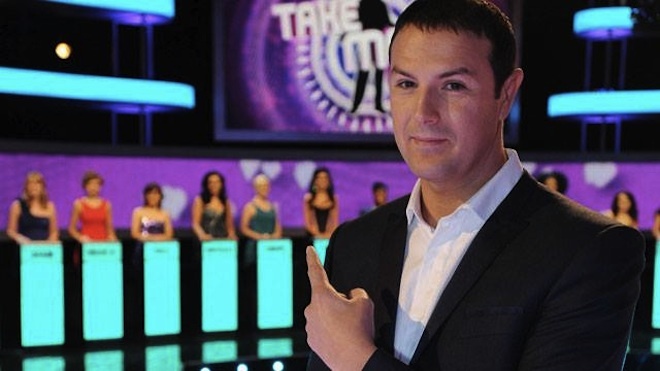 Hosted by lovable northern cheeky chappy Paddy McGuinness, the process of Take Me Out is a simple one. It begins with a catchphrase from Paddy, ‘Bring on the girls’ and the women all strut down the stairs to take their places at lecterns. A ‘girls night out’ party atmosphere is evoked with loud party music playing, the women dancing and wearing their best Saturday night party dresses. Each woman has control of a light, on the lectern, that they each stand behind. A man comes down the ‘love lift’ and presents himself to all the women, announcing his name and home town, there is then an opportunity for the women to turn off their light if they don’t instantly like what they see. Two more rounds follow where the man is given the opportunity to present himself to the women and for them to turn off their lights. To sum this up the catchphrase “No likey no lighty” is repeated numerous times throughout the show. In the first round a pre-prepared video is shown to the women, where the contestant will introduce his lifestyle and interests. In the second round the man will go back into the love lift, change into his ‘show piece’ outfit, and do a turn in an attempt to impress the women remaining with their lights on; normally some activity which shows off muscular strength much to the delight of the women judging him. The man will then have the opportunity to select two women from those remaining. He moves away from the performance area and he takes control of turning off the women’s lights. From two remaining he asks a cryptic question, normally of a ‘What would you do if…’ structure. Supposedly based on this answer he then turns the final woman’s light off and goes on a date to the Isle of Fernando’s with the winning woman. One of the key draws of the show is the element of judgement done not only by the contestants themselves but also by the viewers. The producers encourage this social viewing with the twitter hashtag shown on screen which viewers can use to discuss the show. The viewers are encouraged to judge the women as they cascade hand in hand down the stairs at the top of the show. Paddy asks “Are you ready to meet our beauties?” and each woman has the opportunity to do a small gesture to the camera, blow a kiss, pout or do the peace sign. Paddy then goes in for a chat with women who may have caught the audience’s eye. In the episode I watched, we were introduced to a woman speaking in a broad Yorkshire accent, Bec. With long peroxide blonde hair and dark eye makeup she explained to us that what she was looking for in a man is height. When asked what specific height she’d like her dream date to be, she struggled for a second to calculate 5’4″ plus 5″ for high heeled shoes. Paddy, with a strong Bolton accent himself, commented that next to her, he felt posh. Next, Grace, who stood out because of her statuesque height, was introduced to us as an aerospace administrator and Miss Universe contestant. We were also introduced to a different (but similarly named) woman, Gracie who was shorter than the majority of other women, wearing glasses, lacking in the heavy eye makeup seen on the others; and also not wearing the conventional long curls in her hair. She explained, to the audience’s amusement, that she was a “shark” meaning she will stalk men in clubs as her “fish” then pounce on them “from top” when she then “has ’em”. Throughout the show the women were often not backwards about coming forwards using chat up lines traditionally said by men to women. “You better start planning my funeral because I’ve died and gone to heaven”. For the majority of the programme it is the women who are the decision makers and whose opinions we are most interested in. Their answers are generally decisive and strong willed, and each participant’s strength of character shows through. We are also given the opportunity to learn more about each woman from their conversations with Paddy in which their career and personal ambitions, amongst other characteristics, are often discussed. It could seem from the outside that a show in which women generally considered young and attractive are put on display both for the audience and then a man to judge, is exploitative and show women in a negative light, from watching the programme you can see that the male participants are also judged, by Paddy and the women. And both genders are given equal opportunity to put their foot in it, which they regularly do. Willing participants play exaggerated characters, who are fed answers by programme makers purely for audience entertainment. It’s a pantomime, but a Saturday night TV audience wants entertainment and not reality. This show makes me shudder.